We’ve been hanging around the Florida panhandle for the past few months, and as much as we love it, we’re getting the itch to roll. We’ve got some great stuff planned for the next several months and I’m really excited about it! The past two summers, we traveled west and had an amazing time. We visited 17 states and in particular really fell in love with Oregon, Montana, and Colorado. We love the west, but this summer we decided to do something different. Our good friends Nancy & Betsy of RVaGoGo have spent several summers in Maine, and they invited us to tag along with them this year. So we are heading to the northeast! We’ll be starting out with a visit to the ever popular Cedar Key, which we’ve heard alot about from our friends Chris & Cherie of Technomadia, among others, who have spent a lot of time there. From there we’ll head east, and slowly start working our way up the coast towards Maine. We’ve got stops planned in Jekyll Island, Beaufort, Charleston, DC, Delaware, Connecticut, and Massachusetts. We’ll also head inland a bit for a Freightliner check-up in Gaffney, SC and to visit Deas’s brother and family in Virginia. We’ll spend several weeks in Maine, and we’re also planning a few weeks in Nova Scotia. I’m so excited about all of this and also that we’ll be hanging out with good friends for a good portion of the summer. Over the past couple of months we made a couple of new purchases for the RV. One was a new mattress. We have a king-side bed, and we were still using the two twin mattresses that came with the RV, and they weren’t the best quality. Deas felt like his back was starting to hurt, and so I started searching for a new one. Since I knew a new mattress would need to come in through our front door, I assumed our best option would be to buy two more twin mattresses. 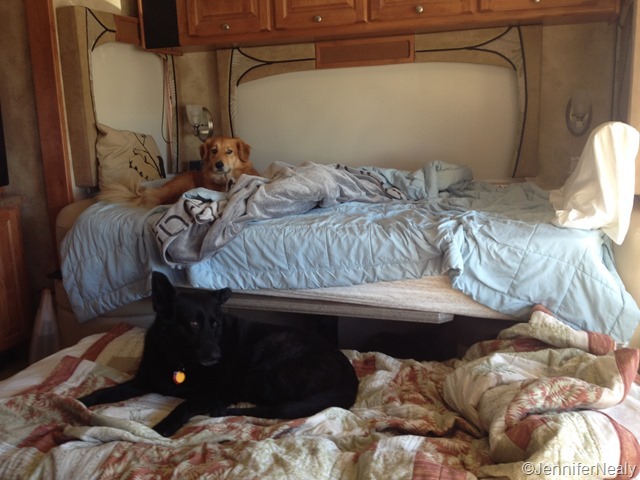 Well, as most RVers know, RV beds are sized slightly differently from stand size mattress. I searched and searched online, but I couldn’t find two twin mattresses that were the same exact size as the ones we had on the RV. In frustration, I turned to my old trusty standby for online shopping – Amazon.com. I didn’t really expect to find anything, but since I’d run out of options, I typed in “RV King mattress.” And lo and behold, once again Amazon came through. The very first option listed was the DynastyMattress Cool Breeze 12-Inch Gel Memory Foam Mattress. We needed a 76×80 mattress, and the one described as “RV King” was those exact dimensions. It was available on Amazon Prime, which meant 2-day free delivery, and the price was reasonable – $580. I was still skeptical, but since there were over 700 positive reviews, we decided to give it a try. We were staying at Grayton Beach State Park at the time, and we warned the rangers that we would be receiving a very, large 80 pound package in the next couple of days. When it was delivered, Deas picked it up at the ranger office, and they were nice enough to help him load it into the car. It’s delivered shrink-wrapped so it was small enough to get through the RV door pretty easily. We brought it into the bedroom, removed the packaging, and sure enough it was a perfect fit! The reviews had warned us that it would have a fairly strong odor for a few days, and they were right. We were prepared for this and had kept the two twin mattresses, so we decided to just sleep on the twin mattress in the living room for the first few days. Of course, RV living rooms aren’t exactly spacious, and as it turned out we couldn’t fit both mattresses on the floor side by side. So we lowered the dinette table, put one of the mattresses there, and, well, I slept on the dining room table for a couple of nights. I’m not gonna lie – it kind of sucked. But the dogs didn’t seem to mind at all. The other new thing we purchased (also from Amazon) is the Dyson Rechargeable Vacuum. With 3 dogs, I do a LOT of vacuuming. We had a Dyson vacuum cleaner in our house before we RVed, and I loved it. But it was way too big to bring on the RV. At first I didn’t want to shell out the bucks for the Dyson Rechargeable, so I got a Eureka canister vacuum. It worked okay, but it didn’t have a beater bar. So it was basically worthless on the carpets. Then I got a Eureka hand-held, which did much better on the carpet, but I still had to use the canister for the non-carpeted floors. Both vacuums stored easily enough under the bed, but it was kind of a pain to have to switch back and forth between the two. Also, neither one had the awesome suction power of the Dyson. So when Black Thursday deals came out in November and Amazon had the Dyson Rechargeable for half-off, I bit the bullet and ordered it. And I’m so glad I did! It works awesome on both the carpet and the hard floors. It tucks neatly under the mattress overhang of the bed (and there’s a plug right there), so I don’t have to lift up the bed each time I want to use it. I use the “high power” setting every time I use it, which supposedly means it only has 9 minutes of run time. However, RVs aren’t big so I’m able to get all the vacuuming done and so far, I’ve never run out of power. Right now we’re in Georgia visiting my family for a couple of weeks, and then the wheels will start rolling east in mid-March! See you on the road! Two very smart purchases. I have the same vacuum and love it.. Perfect for RVing as well as regular housework. I’m surprised your rig came with twin mattresses, we had an RV king in the Dynasty and it was very comfortable. We did put a foam topper, though – it was before foam mattresses were available. And I could not survive without our Sleep Sak. We had a foam topper on the twin mattresses – but the foam mattress itself is so much more comfortable! Yes, we are very excited about the exploring the northeast two as neither of us have spent a lot of time there. There will be lots of photos coming! Love you too! Sounds like you have a great summer in the works! Good to know you can get a RV King through Amazon and that it is a good mattress. It’s so weird they have an odor. We ordered a foam topper for our mattress early on in our travels (and love it) but it was Green Tea scented (!!!) so we avoided the odor issue! The foam topper that we used to have had an odor at first too – I guess it’s just part of the manufacturing process. It’s very chemically smelling – really don’t want to think too much about what causes it! Yes we’re going to miss the west, but I’m really excited about seeing some new things. Should be a good summer! We’re heading east too, but not until the end of summer. We’ll be in Newfoundland at the end of August and won’t move in to New Brunswick and Maine until September and since we’re not full time yet our stay will be fleeting. Can’t wait to see what you guys get up to and what places you find to stay out that way. 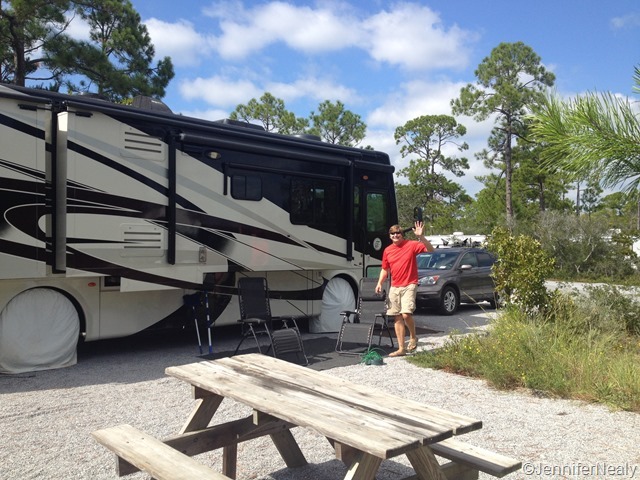 Not many full time rv’ers go west of the Mississippi and it’s hard to find good reviews of places out east. We’re planning to stay up that way through at least August, so there’s a chance our paths may cross. We do have friends that live in Newfoundland and have invited us to come visit them, so we may end up adding that to itinerary as well. That odor in the mattresses by the way is in large part the materials and the fire retardants as well. I only buy showroom mattresses that have “gassed off” for well over 3 months, the chemicals are incredibly toxic to breathe. We bought a regular sized mattress for the rv and don’t care that it’s a couple of inches too narrow for the platform. Just have to be careful not to buy one that is too deep/high. Yeah, I tried not to think too much about what caused the odor but I figured it was something chemically. The smell is all gone now so hopefully so are the toxins! Have a great journey! We really enjoy Maine but Nova Scotia is awesome!! You’ll have to check out our blog for our time in Nova Scotia:) Enjoy! Ooh I will definitely do that! Nancy & Betsy have lots of of knowledge of Maine but they haven’t been to Nova Scotia either, so thanks for letting me know. I’ll definitely read up on all your posts! Maine doesn’t know what’s about to happy to them. Hi Jennifer & Deas, don’t forget to add Harvest Hosts sites along the way and we’d love some more gorgeous photos of your coach at the Hosts! Safe & happy travels. Thanks for the info! Someone else mentioned something similar to me recently, so I will definitely look into this! Now I miss my amazon prime even more! I have a home but being able to stream free movies and canned food for $5 for 50 lbs most of our big purchase were in the summertime in Southern CA heat up a full steep set of stairs! I don’t know what we would do without our Amazon Prime – we love it! Previous Previous post: Florida’s Forgotten Coast…and Friends!